Granite in My Blood: Nehemiah GALLUP, Sr.
Nehemiah (Mason) GALLUP, was the son of Henry GALLUP and was born 19 Jun 1751 in Ledyard. 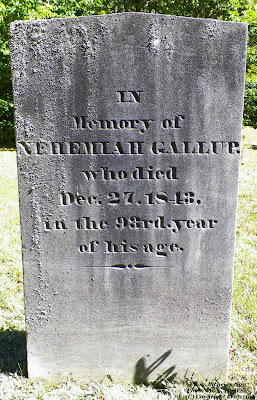 As you can see by the clarity of this photograph, Nehemiah was of advanced age when he died on 27 Dec 1843. Nehemiah was the oldest child in his family and is referred to as Nehemiah Gallup, I.
Nehemiah Gallup II was his oldest son and is buried here. His younger son Luke Gallup is here too. The Gallup (2009) genealogy doesn't mention that he married again but he did. He married Mary/Mercy ELLIOT, who was the widow of Capt. Peter BROWN. Her gravestone, shown below, is next to her first husband, at Whitehall Cemetery clearly states her name as GALLUP and that she was the widow of Nehemiah GALLUP. They were married for sixteen years and died only a year apart. I am still looking for more evidence of Capt. Peter BROWN and this wife Mercy ELIOTT. 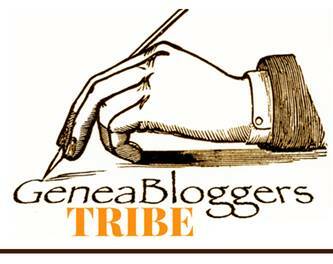 I'm a retired educator and genealogist. I color, plan and journal.